A weekend visit to friends from the Panhard Car Club who live near Lagrasse initiated a love affair with the area and we purchased a house in Limoux that very weekend. Four years later, again during a weekend visit, we discovered the house that was to become Chez Dyna. It was love at first sight despite the extensive work that was obviously necessary to restore this once maison de maitre back to a comfortable and elegant home. Impulsive as ever we agreed to buy the house that weekend. That was in 2004 with us moving here permanently in 2005. We have lovingly restored the house over a 5 year period and our enthusiasm both for the house and the village has not waned. 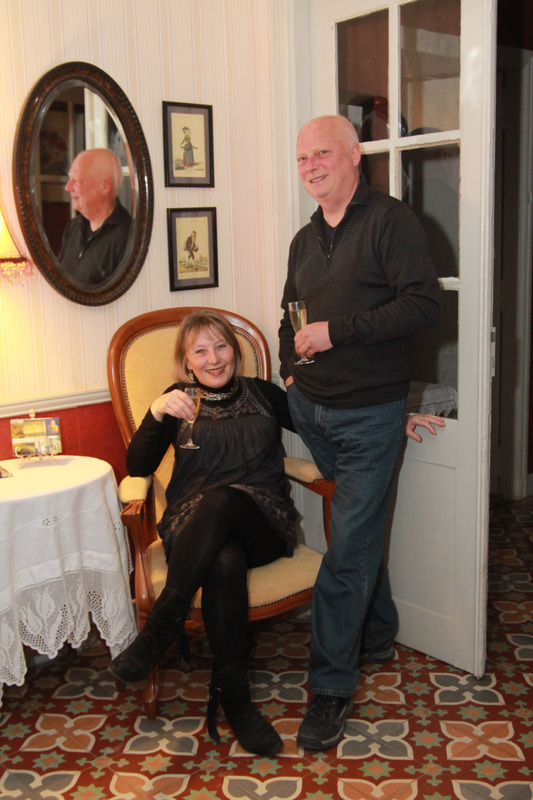 Since opening as a Chambres d'Hotes three years ago we have met many interesting people from different countries. It is a pleasure to share our home and to share stories over a glass or two of wine. Since living here and with the invaluable help of our son Neil, we have added a little cottage and transformed an old forge into a georgous appartment for those who prefer self catering holidays. Most recently we have added an exciting art gallery and boutique gift shop exhibiting works of art and beautiful items of clothing & jewelry. (Click on the link to see more).